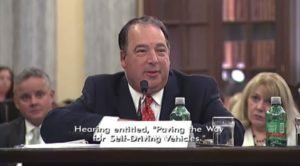 The Senate Commerce, Science and Transportation Committee has held two hearings on autonomous vehicles, most recently Wednesday, but absent from both conversations appears to be the automotive aftermarket that’ll have to fix those self-driving cars. Which is a problem, for mistakes on a repairer’s part could be disastrous. Have a camera or radar system out of place, and the car thinks it’s somewhere it’s not or stops for nonexistent vehicles. Put the wrong windshield on a car, and the camera itself might not work. Fail to calibrate the steering angle sensor after a wheel alignment, and the car is reacting to an incorrect thrust angle. Even if a robust combination of global positioning, radar, mapping and V2V and V2I technology could in the distant future be able to hedge the vehicle’s bets by providing a “second opinion” into the vehicle’s position, would we be able to be confident in the AI’s ability to interpret mixed signals? Or would the car be forced to stop itself and call for help, thereby defeating the purpose of a self-driving car? On Wednesday, the only hint of the aftermarket’s role came during a question about the ramifications of self-driving cars and insurance. “The OEMs would like to be protected from aftermarket adjustments to the vehicle,” Alliance of Automobile Manufacturers President and CEO Mitch Bainwol said. He then switched gears to discuss the potential for self-driving cars to reduce collision frequency and insurance premiums to decline. Last year, the Senate committee held its first-ever hearing on the matter, according to Chairman John Thune, R-S.C. A check of the congressional record shows zero discussion about the issue of repairing autonomous automobiles. Senator GARDNER. Thank you, Mr. Chairman, and thank you to the witnesses for your time and testimony today. I think there has been a lot of great questions today and obviously a lot of interest and intrigue in how this will move forward and what technologies will emerge as a result. The questions, I think, are just the tip of the iceberg here as we all try to figure out and understand how this is going to affect our culture, our society, our innovation, our safety, and our economy. A couple of things. I think it was around 2005 when auto-steer tractors really became the latest rage in agriculture, a useful economic tool for productivity. Today, based on that over-a-decade-long experience, I think if you want to get down to, say, a 12-inch accuracy in the field, whether you’re planting corn or drilling wheat, it probably costs around $7,000 to retrofit an old piece of equipment, a tractor that’s 10 or 15 years old or so. To have it down to a 1- inch accuracy, it’s probably around $28,000 to retrofit an old tractor that didn’t come off the factory assembly line with auto-steer capabilities on it. If you’re dealing with a car that’s going down the interstate, though, the question of accuracy is not something that you—well, we had the accident because we had 24-inch accuracy. This is satellite guidance versus radar, lidar, cameras on the vehicle itself. We’re not talking satellite in any of these vehicles, correct? Mr. ABLESON. The vehicles will use GPS, but they also use an array of other sensors and some very high-definition maps to understand exactly where the vehicle is in the world and position itself very accurately. Senator GARDNER. So as you’re rolling vehicles off the assembly line that could have autonomous technologies or capabilities off the factory line, and we retrofit older vehicles to it, how are we going to make sure that—what is the responsible body from a regulatory landscape to make sure that that used car that’s 10 or 15 years old that has an aftermarket autonomous system placed on it is up to the same sort of calibration or specifics as a factory line car? Mr. ABLESON. In our view, for some of the reasons that we’ve discussed earlier, cybersecurity and safety, we don’t see this technology necessarily being applicable as far as retrofitting to vehicles. To do an autonomous vehicle successfully and safely, you need to touch a number of the fundamental systems in the car, you need to design them—redundancy is not here today. So the idea of trying to take that system and somehow retrofit it on an existing car we don’t think is practical. Senator GARDNER. But somebody’s going to develop that, don’t you think? Just like they did for a piece of farm equipment, somebody’s going to figure out how to retrofit an old car, and who is going to be responsible for that? Mr. ABLESON. As I said, we don’t see a path to be able to do that. However, we fear the committee seems to see the issues autonomous cars pose at a digital level, asking questions about data security and vehicle hacking, but missing the obvious physical threat: improperly repaired or miscalibrated partially autonomous systems. Some of this technology is already available on the market right now in the form of advanced driver assistance systems or “self-driving car lite” experiences; both hearings described senators’ experiences in Teslas, for example. Of course, the government already does make it illegal for any repairer to “knowingly make inoperative any part of a device or element of design installed on or in a motor vehicle or motor vehicle equipment in compliance with an applicable motor vehicle safety standard prescribed under this chapter unless the manufacturer, distributor, dealer, or repair business reasonably believes the vehicle or equipment will not be used (except for testing or a similar purpose during maintenance or repair) when the device or element is inoperative.” So technically, most of this behavior is already prohibited. But some of the advanced safety systems aren’t covered under the letter of the law, the Federal Motor Vehicle Safety Standards — perhaps most notably, automatic braking, which OEMs agreed to provide voluntarily. And technology moves fast, perhaps faster than the FMVSS rules can keep up. While some might not want to prematurely register on Washington’s radar, addressing such issues and educating decision makers up front seems preferable compared to a combination of blissful ignorance and head-in-the-sand behavior. The latter seems destined to produce an even worse combination of a high-profile disaster and a knee-jerk regulatory or congressional action.